The bad news? A single security strategy won’t protect your business while threats are evolving, improving, and growing in sophistication. But the good news is that there are solutions. The polymorphic nature of modern cyber threats renders traditional signature-based defence mechanisms inadequate. On the other hand, in-depth defence techniques like sandboxing are expensive and come with performance overheads. 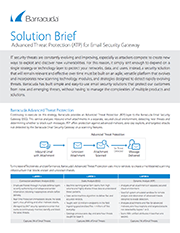 Comprehensive, reliable protection against attacks like ransomware and advanced persistent threats require a layered approach with progressively sophisticated defence techniques that balance accurate threat detection with fast response times. Also, the architecture should provide protection from all threats across all the threat vectors and across multiple deployment surfaces like physical and virtual infrastructures, SaaS services, and public cloud platforms. You need one that stays effective over time. One that’s agile and able to detect rapidly changing dangers. Barracuda’s Advanced Threat Protection for Email Security Gateway includes it all, from link protection to security training, defending you against all known and unknown threats. Click here to request your solution brief for guaranteed peace of mind with email security. As Barracuda Partners, Complete IT Systems can offer you expert advice on the solutions and how they could be effectively deployed in your business. To find out more please call us on 01274 396 213 or use our contact form and we’ll arrange a good time to call you back. Has your business got a reliable backup & data recovery plan? The evolution of spear phishing – is your business prepared?